Eighth International Symposium in Prague, on the theme of Plato’s Statesman. From 10th to 12th November 2011 at the villa Lanna (Praha 6, V sadech 1). 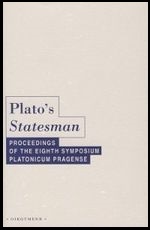 Plato’s Statesman, Proceedings of the eighth symposium Platonicum Pragense, Aleš Havlíček, Jakub Jirsa, Karel Thein (eds. ), Praha, OIKOYMENH, 2013. Symposium se konalo 10. – 12. 11. 2011 v Praze.